The APC series is very excited to welcome Gumout Performance Additives as the official event sponsor for the opening race of the 2017 season. The event will take place on May 27th in Innisfil Ontario at Sunset International Speedway, and kick off a winter long build up for the 2017 season. The previous 2 seasons for the APC series saw the opening event held 2 weeks prior to this, however with poor weather plaguing that weekend historically the series and the track decided it would be in the best interest of racers, fans, & sponsors to move the event 2 weeks later in hopes of catching beautiful weather. This event in 2016 was pushed to June due weather and would serve as the second event of the season it was won by eventual 2016 champion Andrew Gresel, and marked back to back victories for the Sauble Beach driver to begin what would be a championship calibre season. Gresel overtook Dale Shaw late in the race to claim the victory, while Shaw would go on to bring home his #83 in second place while the driver of the #23, Shawn McGlynn would come home third earning his first career APC series podium finish. 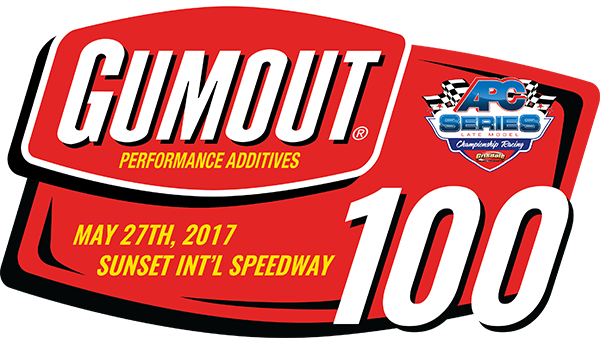 The APC Series is thrilled to welcome Gumout performance additives to our growing list of event sponsors for the 2017 race season and look forward to a terrific opening event for the 2017 race season on May 27th at Sunset International Speedway. Be sure to pack the track and kick off what is sure to be a fantastic event and great season for the APC Series.